Nano-Ceram is a light cured nano-hybrid composite containing a special blend of nano and micro filler to produce aesthetic results second to none. Through a sophisticated manufacturing process integrating the nano-fillers in the resin matrix, the results are great aesthetics and ultra-low wear. For professional use only. This product cannot be purchased for personal or home use. These two tests are often overlooked in a composite as sales reps tend to focus on the horsepower race as to who has a stronger product since the numerical value of this number is easier to explain and understand. Yet these two values have the biggest effect on the overall performance of the composite. They go together to help determine the long term performance of the composite. It is important that you achieve a balance between these values and not just try to raise one value by changing the molecule size and losing or reducing another value. Some may think that if the Polymerization shrinkage is low so will the water sorption be. That is not true and a simple glance at these two charts will tell you that. In order to restore a tooth in such a way that it is leak-proof, there must be no dimensional mismatch at the tooth-restoration interface. Perfect adaptation should be obtained during polymerization and maintained for the lifetime of the restoration. Unfortunately, due to their chemistry all dental restorative products shrink during the polymerization reaction. Modern nano-hybrid composites have managed to reduce this effect significantly. Studies have shown that low shrinkage results in less stress on the adhesive bond and lower deformation of the tooth structure during polymerization resulting in much better margin integrity and quality. Therefore polymerization shrinkage is an important property for the restorative materials. There are several methods of measuring polymerization shrinkage. In a study done at the University of Manchester in England, using a method called “linometer” was performed. 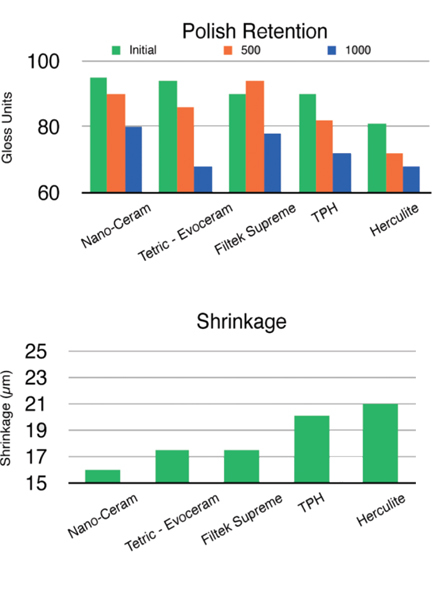 Nanoceram Bright is among the products with the lowest polymerization shrinkage and displays less shrinkage compared to TPH and Herculite. True many dentists layer in the composite so that the second layer covers the shrinkage of the first and so on. This means that the dentist knows fully well that this shrinkage is a factor that they need to deal with to achieve marginal integrity but the shrinkage stress against the bonding agent is still there and of course the dentist needs to deal with the shrinkage on the last layer. If they overfill they need to grind back to achieve the margin fit. Now what about the water sorption and solubility part? on the surface and into the body of the restoration. 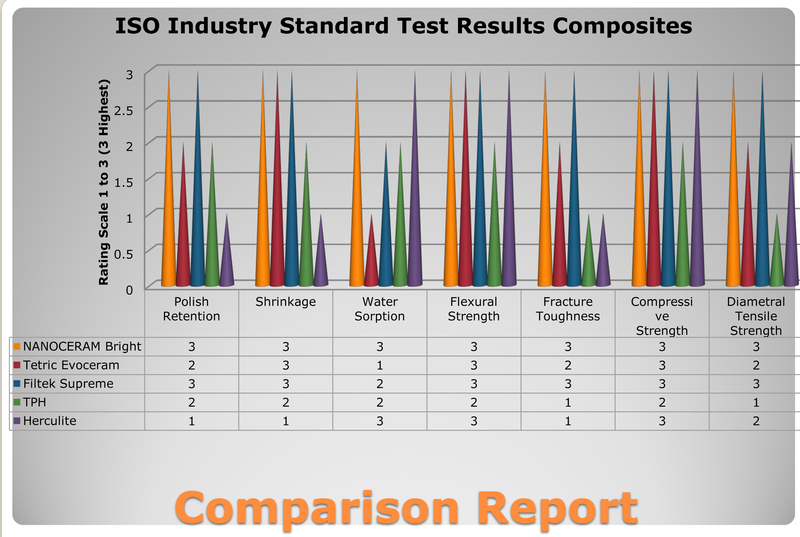 There are several negative effects that are associated with the water sorption and water solubility of the composites. The release of unreacted monomers from resin composite may stimulate the growth of bacteria around the restoration and promote allergic reactions in some patients. The water uptake can lead to deterioration of the physical-mechanical properties of the composite such as dimensional stability, flexural strength, elastic modulus, compressive strength, wear resistance etc. Not to mention the discoloration around the restoration or margins that looks like staining and minimizes the aesthetics. The unique formulation through careful raw material selection and processing of Nanoceram Bright keeps the values of the water sorption and solubility to minimum compared to similar products of other companies tested such as Evoceram, Filtek Supreme, TPH and Herculite. These tests were completed at the University of Manchester, England. It can readily be seen that Nanoceram-Bright has the lowest polymerization-shrinkage for excellent marginal integrity and the lowest water sorption values to preserve the mechanical values and aesthetics of the restoration longer term. You can also see that while Tetric and Filtek have about the same polymerization shrinkage they have the worst water sorption. Herculite has the worst Polymerization shrinkage but is second to NanoceramBright in water sorption. This shows there is no correlation between the two values. Studies at University of Manchester, England.